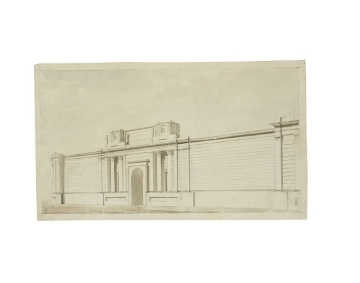 The gateway on Lothbury Street resembles a triumphal arch. As in the Arch of Constantine, the gateway is surmounted by four figurative statues. Each statue is situated above a pilaster. 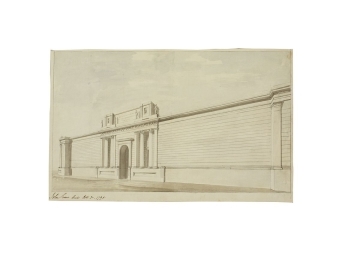 The statues were not included in the executed design of the screen wall but similar ornaments were later integrated into the Bullion Arch at the south side of Lothbury Court in 1798-99 (See SM 12/3/1 and 12/3/15, drawings 69 and 70 in 2:7).